Beachfront Duplex Penthouse Apartment, fully air conditioned, german designer kitchen, sun terrace, superking beds, wifi, equipped with everything you need for a fantastic vacation experience. With its fabulous West Coast location, our beautiful beachfront apartment is just a few feet from the waters' edge; it's just about as close to the sea as you can get & it's our little bit of paradise! 'The Wicket' is a gorgeous split level penthouse home with open plan living areas, high vaulted ceilings and a balcony terrace with uninterrupted views of the sea. Very modern & light, the spacious top floor living and kitchen areas are air conditioned throughout & offer every modern convenience. The lounge has comfortable sofas along with TV, DVD player & telephone for free local calls. A selection of DVDs & books are available for use during your stay, and there is free wifi throughout the apartment. The top floor is also home to the air conditioned master ensuite bedroom and a further full bathroom. The ground floor houses the second air conditioned ensuite bedroom, entrance, utility room plus the third bedroom with a double futon bed. It sleeps up to six and is fully equipped with everything you need for a luxury vacation experience. The open terrace has sun loungers along with a BBQ, dining table, chairs & sunshade…perfect for watching the spectacular Caribbean sunsets. 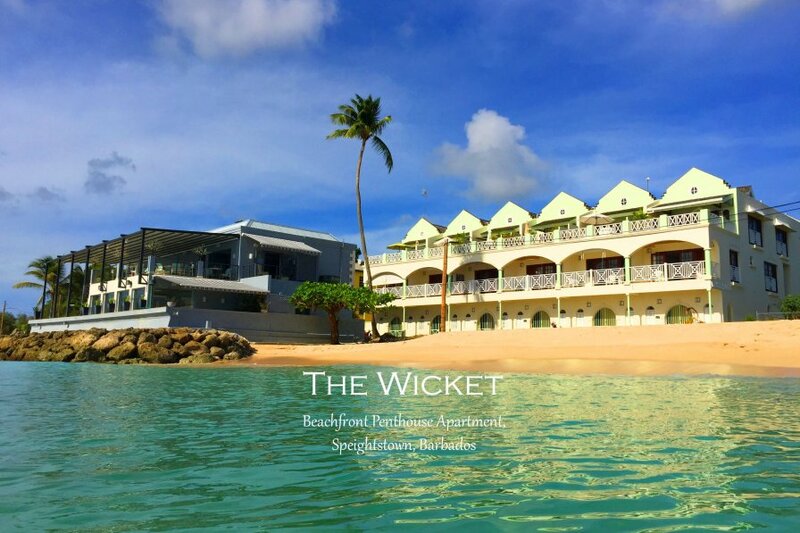 With easy access to local shops, restaurants and bars, golf, watersports, cricket, horse riding & situated just on the edge of historic Speightstown, this is an exceptional duplex apartment that enjoys a private terrace with direct sea views. Upper level - Ensuite bedrooms with a king bed and high vaulted ceilings. Built in wardrobe, air conditioning and ceiling fan. Ideal for 2 adults or 2 children. Lower level - Large ensuite air conditioned bedroom with super king bed which can be separated into twin beds, built in cupboards, cable TV. Ideal for 2 adults or 2 children. Lower level - Smaller bedroom with double Futon bed, cupboard, ceiling fan. Due to smaller bed, ideal for 1 adults or 1-2 children. German Poggenpohl kitchen with Neff appliances - double hob, large fridge freezer, electric oven. Microwave, Bosch Dishwasher, Nespresso Coffee Machine, Krups Toaster, Bosch Kettle and many other kitchen appliances. Washing machine, tumble dryer, hand washing basin, electric water heater, ironing board/iron. Sitting area with 3 large 3-seater sofas, 2 side tables, coffee table, flat screen TV, cable TV box, DVD player, CD player with iPod attachment, Wifi, Telephone with free local/international calls to landlines. Dining area with 6 seat dining table with Italian Calligaris dining chairs. The open terrace has a covered area as well as an uncovered area perfect for private sun bathing, along with a round glass dining table & chairs, BBQ and large retractable sun umbrella, sun loungers. Towels, Beach Towels and linens are included and maid service is provided weekly. Children welcome (travel cot & high chair provided), suitable for the elderly subject to use of stairs. 20 feet from the beach which is very quiet and offers great swimming. You can also walk along the beach to the north where there is a long and quiet beach leading up to Port St. Charles luxury marina.